Strict rules on winter tyres in wintry conditions were not enough to save German drivers from superlong queues today as a weather storm toured northern Europe. Also, Brittany Ferries doubles the number of no-frills sailings between the UK, France and Spain. A shocking amount of roadkill ends up on Belgian roads each year. Germany suspends its minimum wage for foreign truckers rule. Mobile snow storm sees drivers trapped for hours in northern Germany despite mandatory winter tyres. 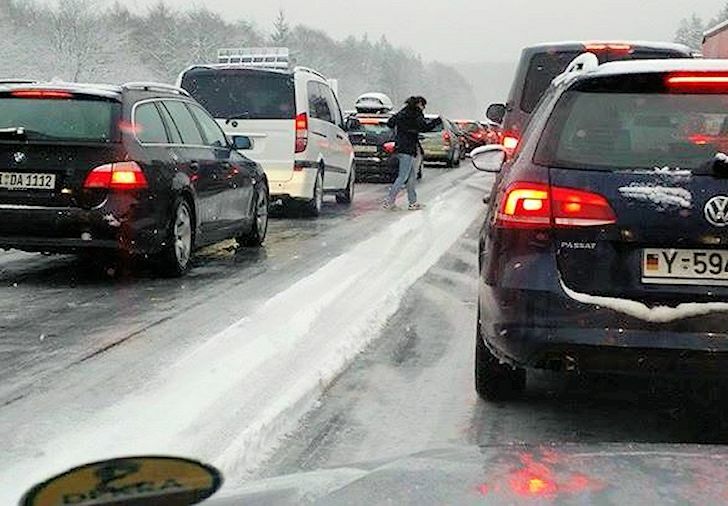 A flash mob of wintry weather toured the Continent today leaving traffic chaos in its wake, especially in Germany. A combination of freezing rain, sleet and wet snow struck the Netherlands overnight before moving south and east through the day. Drivers in Lille northern France were hit briefly mid-morning. The storm then made its way over the Ardennes in eastern Belgium to Luxembourg and Saarbrucken in the afternoon. As dark fell the region around Karlsruhe, Heilbronn and Stuttgart saw heavy snow as did roads between Lausanne and Geneva in Switzerland and Bourg-en-Bresse in France. The A40 was particularly badly hit. By far the worst affected region however was northern Germany, between Dortmund, Kassel and Osnabruck. Despite M+S marked ‘winter tyres’ being mandatory in wintry conditions drivers were left stranded for hours on the A2 and A7. 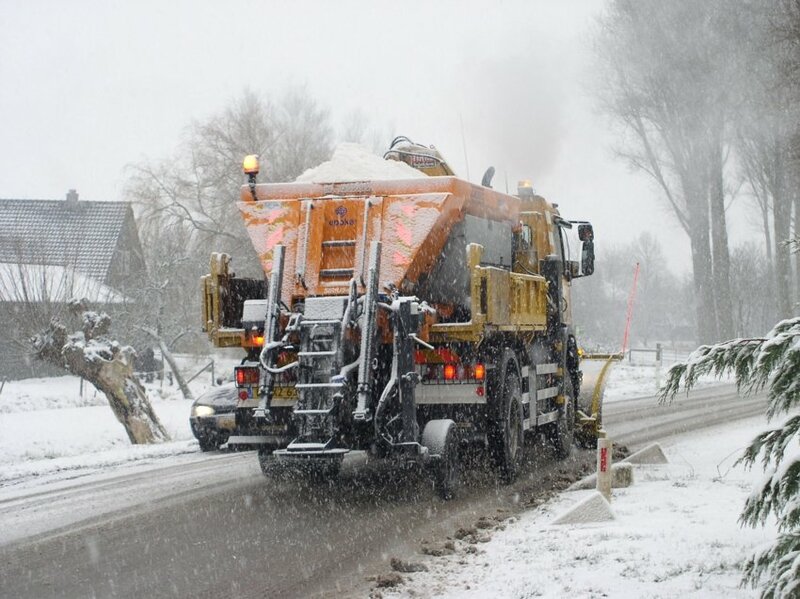 Packed traffic saw snowploughs unable to reach the trouble spots according to local reports. A succession of incidents on the A2 towards Hannover saw queues reach 35 miles in the evening before gradually clearing overnight. Amazingly, it appears there were no injuries. Germany joins the list of supposedly winter-prepared countries that nevertheless suffered major disruption as first snow hit this winter. Moscow saw its biggest jams of all time on Christmas Day while Finland suffered an ‘accident epidemic’ in November as ice and snow swept in from the east. roundup: CROSSING THE CHANNEL. Brittany Ferries has chartered another ship for its no-frills ‘economie’ sailings between the UK, France and – at weekends – Spain. The service, launched last March, was almost immediately booked up for the entire summer. One way fares start from £79 to France and £209 to Spain, the latter especially much less than Brittany Ferries’ regular ‘cruise ferries’. The new ship is the former DFDS Sirena Seaways and comes on stream in May. Brittany Ferries is now the only operator to sail between the UK and Spain. BELGIUM. Eight million animals die on the roads each year according to a survey by environmentalists (or 27m depending on which counting method is used..) reports FlandersNews.be. With no figures from other countries available it’s impossible to say if this number is as large as it seems. Researchers blame the dense Belgian road network. GERMANY. The new rules which mean foreign truckers must be paid at least the minimum wage while on German territory – even if they don’t stop, or work for a German firm – has been suspended. ‘The government now wants to await a decision by Brussels on the matter,’ said German transport minister Andrea Nahles after a meeting with her Polish counterpart Wladyslaw Kosiniak-Kamysz in Berlin today according to local thinktank CEP. The suspension only applies to transit journeys says thelocal.de.